"Daskid Kids Behavior Chore Chart" is a magnetic dry erase chart for children 3 years and up, that aim to encourage responsibility and independence at an early age. 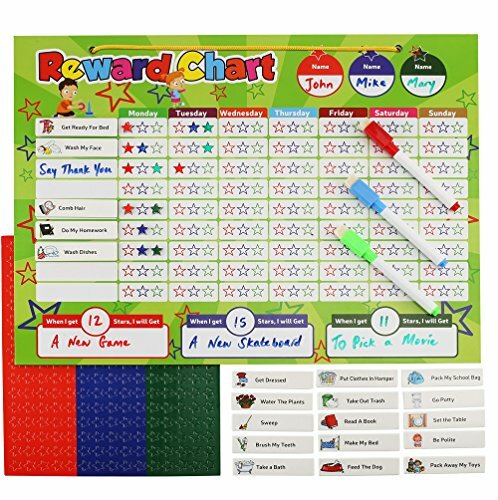 The reward chart acknowledges children's positive behavioral changes at home, school and/or classroom, by rewarding them and keeping them motivated to continue being responsible. Children can collect stars for the kids chore chart each time they demonstrate the relevant behavior and then exchange the stars for a reward later on. Chore Chart can be used for up to 3 kids! Use it instead of your behavior clip chart. Magnetic Dry Erase Star Chart 16" x 12" with Magnetic backing & Hanging loop, which can be used on a refrigerator or wall. "The Entire Back is Magnetic". For best results, remove the string when placing it on the refrigerator.The string can always be placed back if you ever want to hang it on the wall. 20 Awesome Magnetic Chores with Kid Friendly designs! Pictures designed to help young children independently recognize tasks. 210 Magnetic Stars in 3 different colors, 70 Red, 70 Blue and 70 Green. Magnetic stars works better then behavior stickers. 4 Color Magnetic Dry Erase Markers, Red Blue Green and black! Chores and Stars can also be filled in with the Dry Erase Marker! You can write your own chores list. Magnetic CHORE CHART can be used on Refrigerator or Wall for up to 3 kids! There are 20 Awesome MAGNETIC CHORES with Kid Friendly Designs! Includes 210 MAGNETIC STARS in 3 Different colors, 70 Red, 70 Blue and 70 Green ● Your Stars won't get lost! When Stars are not in use, it can be placed back in its Original Board! Comes with 4 color magnetic DRY ERASE MARKER Red Blue Green and black! Chores and Stars can also be filled in with the Dry Erase Marker! If you have any questions about this product by DasKid, contact us by completing and submitting the form below. If you are looking for a specif part number, please include it with your message.